Lizabett Russo, a Romanian-born singer whose songs were included in a BBC compilation, had to confront a lot of stereotypes when she moved to Scotland. But she gradually discovered her voice and her courage. The images are from The Traveller’s Song video, played by Lizabett Russo, a Scotland-based musician, who was born and raised in Brasov, in central Romania. The video abounds with loneliness, but it also has a sense of adventure and hope. Just like in her song, Lizabett has wandered for a while, in search of a place that she could call home. The young woman, whose music Tom Robinson from BBC Radio 6 described as "This is simply world-class work, by any standard", started playing only after she left Romania and moved to Scotland. She was 18, knew nobody in Aberdeen and wanted to kill the solitude. So Lizabett bought a guitar. Lizabett, whose Romanian name is Elizabeta Rus, grew up listening to traditional folk music. Her mother Elena would sing songs from the repertoire of the famous Romanian singer Maria Tanase. She was a shy kid. She talked very little and never thought she’d become a singer. She first started writing poems as therapy. If she couldn’t tell it to anybody, she would write it on paper. At 18, she moved to Aberdeen for her studies in sociology and felt lonelier than ever. Lizabett started playing “because of solitude and depression, the best possible reasons”, after buying a cheap guitar from the Internet, she explains laughing. The singer stayed in Scotland for two years, then started traveling: to London, Japan, South Korea. She changed a lot of guitars during this time. “They all have a story, I met them somewhere along the road,” Lizabett says. Lizabett self-released her EP entitled The Traveller’s Song in 2013. She then performed in several countries across the globe: the Netherlands, Switzerland, Spain, France, Japan or Seoul. She released her debut album Running with the Wolves in 2015, and then the second album, The Burning Mountain, last year. Tucked in her jacket, Lizabett looks at the snowstorm covering Bucharest. She has arrived at the bar where she’s about to perform this evening, but the bar owners have yet come, so Lizabett awaits in a car together with the sound guy. It’s January 2017. She has come to Bucharest to record a song with a local singer, and has also been invited to play in this little bar in Romania’s capital. Inside the car, Lizabett and the sound guy talk about being an immigrant, as the snowfall becomes thicker and thicker. He asks her if it has been difficult to adapt to a new country. Some of his friends have moved to London and have good jobs, he says, but they still feel that immigrants are being looked at with a certain superiority. Lizabett confirms that it wasn’t easy in the beginning, even if Scotland is friendlier than Great Britain. She too can sometimes sense a very subtle change in attitude after her concerts, when she says that she’s from Romania. “I’ve discovered a reality that I wasn’t aware of, maybe also because I was living in my own world. (...)When you discover all the stereotypes about Romanians, it upsets you,” she says. It was very annoying to be constantly attacked with these images about how you presumably are as a Romanian, Lizabett adds. 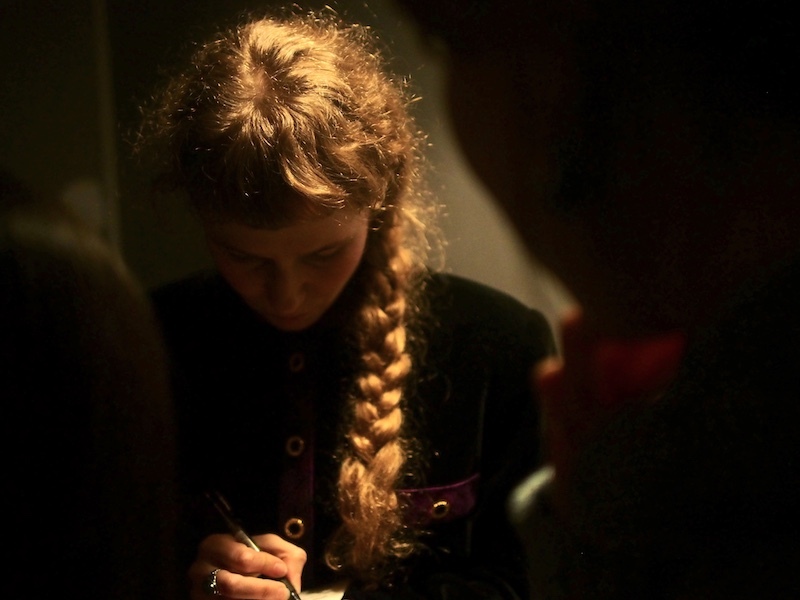 As she began to write music and perform, she forced herself to stop feeling that way. You can’t go on stage and feel ashamed that you’re Romanian. She believes many Romanians share this complex of inferiority. It’s a cultural thing. It runs through families and the entire society. “It took me years to get rid of it,” Lizabett says. Her songs are about society, and some of them are political. The system works only for those who have money while the working class remains the working class, not matter how many generations go by. For her concert in Bucharest, Lizabett has brought along a guitar with a special history. She received it from a woman in Scotland who has attended many of Lizabett’s performances. One evening the woman told the young Romanian that she had an old guitar that she might like. Lizabett received the gift and discovered that it had a sign with “Made in Rumania”. She thinks that the guitar is probably very old, from a period when the country’s name was still spelled with an ‘u’. Lizabett, who’s in her early twenties now, says that she’s often very anxious in the presence of other people; but not when she plays on stage. It’s quite the opposite. She likes to interact with people and all the shyness melts away. In October last year, she played at the BBC office in Aberdeen. One of the songs she performed was the traditional Romanian song Ciobanas cu Trei Sute de Oi (The shepherd boy with 300 sheep). The sound is a total failure in the Bucharest bar, and Lizabett can’t plug in her instruments. She likes to experiment with different sounds, but this time she is forced to play only with an acoustic guitar. Lizabett doesn’t get bitter but starts making fun of the situation in front of the audience. She feels like a standup comedian now, she says. People seem a bit uncomfortable in the beginning- a young girl making weird jokes and asking them questions. But they soon relax and become friendlier with the performer. Two hours later, people join Lizabett in covering Elvis Presley’s Can’t Help Falling in Love. It’s a room full of people singing- almost whispering- ‘Wise men say only fools rush in but I can't help falling in love with you’, while outside the snowstorms keeps howling.